In reviewing volleyball coaching as a whole “reading the game” is the biggest change in volleyball coaching in the last 7 years. 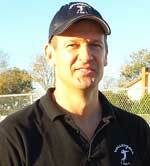 The ideas were first introduced by Karch Kiraly at the AVCA convention in San Antonio Texas. See the talk here! In review “reading the game” is an area of coaching I most often hear high school and club coaches struggle to teach and are most interested in learning. Yet the majority of experts are teaching “Reading the Game” wrong in my opinion! In this article I will review how the most successful fighter pilot in USA Air Force history may offer a better way and why! In personally reviewing these ideas with Karch Kiraly, Ron Larson and Tom Black (Some of the original pioneers on the topic) and then try to coach it as well as execute myself as a high level player, I came to realize there were important points and verbal cues missing. Firstly, just because you see it, does not mean that you see it. You have to get meaning from what you see! If you don’t know what I am talking about watch my Renshaw video example with Dr. Bill Harrison. Article 2 on the Reading the Game. Bill Harrison is one of the best sports eye doctors in the world. This fundamental problem forced me to seek a better explanation and I found my answers in one of the most researched industries in the world: aerial dog-fighter combat. The pioneer and perhaps the lead innovator on this topic is John Boyd. 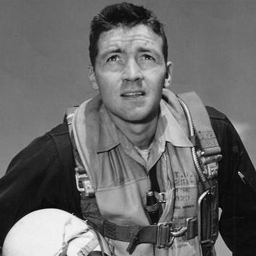 Colonel Boyd, known as the “Fighter Pilot who changed the Art of War”, was an F-86 pilot and commander of a fighter group during the latter part of the Korean War. Known as 40 second Boyd his skills in the air were such that he could kill most enemy combatants in just 40 seconds. His ideas revolutionized the Airforce and Colonel Boyd trained his pilots based upon his observations of human reaction time and as a result his pilots had a 10 to 1 kill ratio over the superior Mig-15’s. Colonel John Boyd coined the term O.O.D.A. Loop, in the 1950’s. The O.O.D.A. Loop is a process we go through hundreds if not thousands of times in a single day. It is a process that defines how we humans react to stimulus. His observations led him to a greater understanding of human reaction time and the coining of the term O.O.D.A. Loop. Human reaction time is defined as the time elapsing between the onset of a stimulus and the onset of a response to that stimulus. The O.O.D.A. 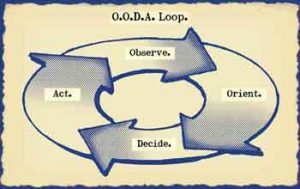 Loop, which stands for Observe, Orient, Decide and Act, is Boyd’s way of explaining how we go through the process of reacting to stimulus. Keep in mind “Reading the game” in volleyball is nothing but “how we react to stimuli”. In the Orient stage you are now focusing your attention on what you have just observed. “Orientation is the schwerpunkt. It shapes the way we interact with the environment – hence orientation shapes the way we observe, the way we decide, and the way we act.” – John Boyd. (The Schwerpunkt is the center of gravity or point of maximum effort!) John Boyd described it as the most important part of the OODA Loop and most people completely miss it when teaching “reading the game” for volleyball. “Any man facing a major decision / stimuli acts, consciously or otherwise, upon the training and beliefs of a lifetime.” – John Boyd. Personally I feel Orientation is the big missed key in current “Reading the Game” concepts as I discussed earlier with my Renshaw video example with Dr. Bill Harrison. Article 2 on the Reading the game concepts. The next stage is the Decision step in which you have to make a decision or plan our action based upon what you have just observed and focused our attention on. Finally you have made your decision and the last step is to Act upon that decision or perform the volleyball skill. Keep in mind that the O.O.D.A loop is what happens between the onset of a stimulus and the onset of a reaction to that stimulus. Now the problem I find is most youth coaches do not have the tools or utilize the correct language to help players understand what they are missing as it relates to reading the game. Because most coaches do not use the OODA Loop language, specifically “ORIENTATION” they therefore cannot adequately explain to their players what they are missing! If you are a high school coach or club director looking to teach your staff and players each fundamental skill specifically as it relates to “reading the game” and the OODA Loop let me know! Over the course of our 4 day summer camps we teach each volleyball skill relative to reading the game. Remember if you are just teaching volleyball skills you are only teaching your players 25% of performing the skill in a game like situation! Did your players the correctly observe the information rich areas? Did your players do a visual switch off the information rich area back onto the ball in order to slow the ball down using vision? Did your players look at the correct spot on the ball in order to increase their chances of digging it? (For example hitters in baseball change where they look at the ball depending on the pitch and where they want to hit it. The same is true on defense. Did your players get meaning from what they saw? Did your players use mental models before the ball came in order to better predict what they would do? Did your player plan correctly? Did your player suffer from “response complexity” and therefore could not plan? Did your player suffer from “Hicks Law” and therefore could not plan? This is what most people teach when they teach digging. Notice the act of digging or performing the skill is only 25% of what goes on during a dig! If you are interested in learning more about our approach to coaching volleyball and why we think it is the best system for coaching volleyball contact me. You can feel confident that during our 4 day Volleyball1on1 Summer Camps for high schools and clubs your players will learn 70-80% of what they will need to know over the course of a season. This includes concepts and verbal cues! We are also the only organization that offers a complimentary coaches clinic with full volleyball coaching manuals during our volleyball summer camps. Contact me below to schedule a call to review further. To Your Ultimate Volleyball Success! 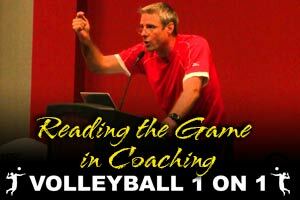 Go Here – To read and see dozens of articles and videos on “reading the game”, the OODA Loop for volleyball and my personal Volleyball Coaching Blueprint for “reading the game” and volleyball strategy. This is an area of volleyball coaching I am pioneer in and extremely passionate about!